In my Easter egg compilation yesterday I promised you to make new Easter egg projects this year. This is the first one I want to share with you. These cute Easter bunny egg cozies are perfect for an Easter brunch. They keep your eggs nice and warm! Best thing? You don’t have to sew anything! You do have to do a little bit of embroidery, but everything else is glued in place. A fast and easy Easter DIY project that you can keep and use for years to come. I love to create different Easter egg projects each year. I searched trough my archives and I found these three lovely ideas from earlier years. Of course there will be new Easter egg diy projects this year but I wanted to really get in the mood with some projects I already made. 1. This Decoupage Easter Egg diy project was made with napkins I got from my little brother when he was just five years old. He just turned 12 but I still love the print! This is my absolute favorite Easter egg diy project! 2. Someone asked me if I knew ho to decoupage a picture on an egg. Well I figured it out and made a diy tutorial out of it that you can find here. 3. These cute yarn wrapped Easter eggs are from last year. I thought it would be a great idea to make a pouch for Easter. It is great as a gift bag with chocolate or candy eggs inside! It’s also great for kids to carry around while searching for hidden eggs. I made this from one of the vintage fabrics that I bought yesterday. 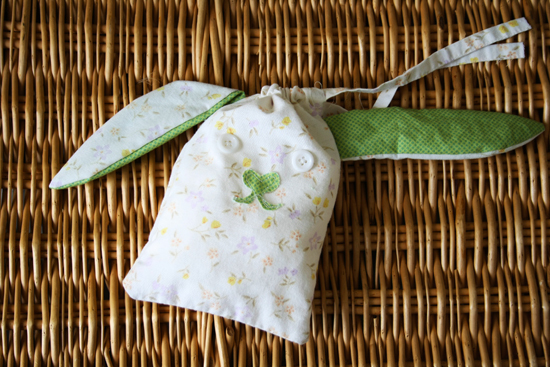 It’s a very easy thing to make and your guest will love this cute Easter bunny pouch as a gift bag! 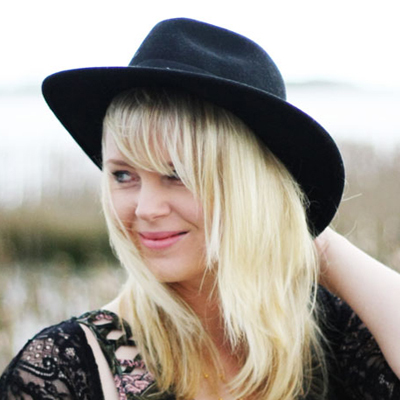 It’s finally time for a new DIY project on ByWilma.com! I thought it would be nice to do my tutorial in illustrations this time. It has been a while and I thought a new start needed also a new layout. So I hope you like it! 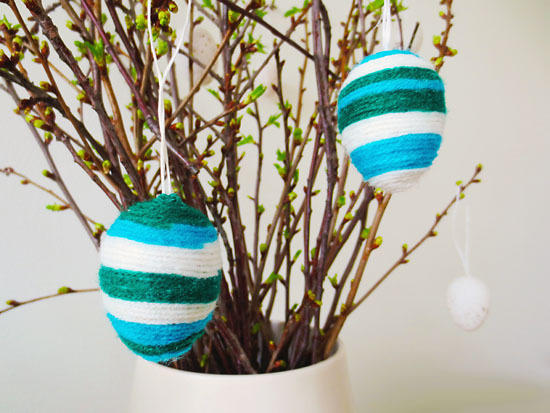 These yarn wrapped Easter eggs are really pretty to look at and perfect for hanging in some branches. I love the look of the yarn and the endless color possibilities you have with it. I used fake eggs for this project but of course you can use real ones too. The reason why I used fake eggs is that they are a lot easier to handle than the real deal. But it’s your choice! If you want to use real eggs you can use my decoupage Easter egg tutorial from last year for the ‘blow out’ part. I have a little brother who is 17 years younger then I am. When he was like 5 years old (don’t pin me down on that one) he brought me these napkins from a holiday to Scandinavia. I think the design of the napkins really represents Scandinavian design. I love them! I don’t have much of them left unfortunately, so I decided to make something with them that would last me a little longer then just napkins. I mean; don’t you think he had a great taste at such a young age? I thought it was so sweet of him to bring them home for me. These decoupage Easter eggs are made with those napkins!